Joe McClure spent his childhood in Detroit buying cucumbers and dill at farmers markets. Now, he pickles professionally. As Joe McClure tells it, one hot late-summer morning each year throughout his childhood, his father, Mike, would wake him and his brother Bob at the break of dawn. It was pickling day, which meant a trip to the farmers market, from which the McClure men would return home with bushels of cucumbers and fresh garlic and armloads of dill sprigs. Over the course of the next 10 hours, the McClure clan would brine some 60 quarts of homemade pickles, which Mike gave to friends and colleagues around the holidays. Fast-forward to 2006, when the sons, now adults, started missing the annual family tradition. Bob McClure, an actor living in Brooklyn, New York, flew back to Detroit, where his brother, Joe, and family still lived. The brothers dug up their grandmother's recipe and concocted a large test batch of garlic-dill pickles. Joe took jars to Michigan markets, and Bob began distributing pickles to bars in Brooklyn. Demand was strong, so the family used $50,000 in equity on a condo they owned to finance commercial kitchen space in Detroit. "We did farmers markets just to get the name out, and get some foot traffic," Joe McClure said. "We bought all our equipment on eBay and refurbished it. Bob had a friend who designed the label for us. The website was done by a friend." Today, an estimated 70 percent of McClures sales of pickles – a second, spicy, variety as well as new products such as relish and Bloody Mary mix – comes from retail stores, with online and market sales comprising the rest. 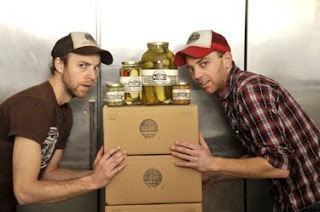 Since landing national distribution with Williams Sonoma and Whole Foods, the McClures – Joe, his mother, Jenny, father, Mike, and a couple employees, have been hand cutting and brining up to 800 jars of pickles each day. The family is committed to using as much local produce as possible, and the jars' labels are printed using vegetable inks by a press powered by hydroelectric and wind power. Joe, who is studying for a doctorate in Physiology at Wayne State University, runs the Detroit operation from a 2,300 square foot commercial kitchen. On pickling days, the whole crew wakes at 3 or 4 a.m., so a batch of pickles can be completed before Joe heads to school at 10:30 a.m. to work on his thesis on the neurocontrol of circulation. Asked if he plans on staying in academia, Joe says: " I originally did, but right now I'm having more fun with the pickles." Love the story! Love the pickles! Where can a gal like me get a t-shirt? ?